Western Civilization owes its intellectual accomplishments to the achievements of two great cultures. Egyptians are credited with the origin of language and writing, the basis of scholarship, while ancient Greeks lay claim to our understanding of nature, science and reason. But while these two great empires are often blazed in the books of human history there remains an unknown and mysterious benefactor in the form of a tree. Camping among the kangaroos and emus, ViewZone editor, Gary Vey, burned a large piece of frankincense from Yemen at a remote campsite one evening. The strong perfumed scent carried throughout the site and initiated a discussion about the origin of this fragrant resin. Frankincense was an important substance in the millennia before Christ. It was obtained by collecting the sap from a special tree that grew only in the Arabian peninsula and was the basis of wealth for the Queen of Sheba. On a hike the following morning, John noticed a chunk of yellow substance on the base of an evergreen tree found throughout the Australian continent. A quick sniff identified the chunk as the tree’s resin and recalled the discussion of the previous evening. Taking a butane lighter, he heated the chunk and allowed it to smoke. The sweet perfumed scent was immediately recognized and our expedition party was soon collecting more of this resin for the next evening’s camp fire. We became curious about the strong similarities to frankincense and asked John to tell us more about this unique tree. We were not prepared for his discussion. It turned out that the common evergreen, really a Cypress tree of the genus Callitrus, had played as important a role in human civilization as any famed Egyptian pharaoh or Greek philosopher. Further, as John traced the written history of this tree, we learned a lineage of greatness that, like frankincense, had its roots in Yemen. 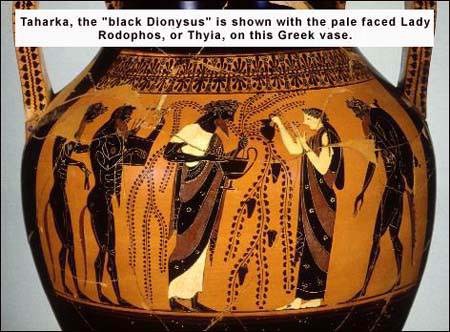 Taharka (Apollo/Dionysus/Aesop) and his sister Rodophos Nitocris=Athena Nikephoros/Thyia, establish the Thyia forests of Delphi, Dodonna, Thebes, Siwah, etc. The names Thyia and Rhodopis came to be confused, with historians treating them as two separate individuals; they were in fact referring to the same person. Rodophos was an appearance title, while Thyia was a functionary title. She was the High Priestess of the replenishment rituals. 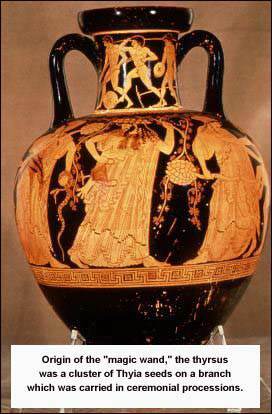 Her ‘Thyiades’ were the rest of the female virgin priesthood of Fertility and replenishment of the Sacred Thyia tree. Why was this particular tree so significant? There can be no doubt that the sacred resin of the Thyia tree called ‘Thy-ion’ burned in the censors of Thebes, Siwah, Dodonna and Delphi. Thy-ion was indeed the universal resin — the HOLY SMOKE, the incense of Prophesy. Perhaps it had some hallucinatory properties. The 26th Dynasty of Egypt was eventually conquered by Ashurbanipal in the year 666 BC. The Priesthood of ON, in a diaspora out of the maws of the 666 BC Beast, carried the ripe seeds of the future Thyia forests of Delphi and Dodonna; the seed still within the unopened pods, thickly encrusted on the branches, in the form of Thyrsus’, piled high in the holds of their merchant ships. All cultural explosions of this era can be attributed to this Great ‘end of the old world’ Exodus, from the Old World to a New World in the Northern Mediterranean, Europe and as the site of the Colorado Canaanite inscriptions tell us, the Americas, (book of Mormon: story of Nephi’s escape from the Assyrian Beast in 666 B.C.). The ‘Thyrsus’, precursor of the fairy wand, was the fertility instrument used to propagate the forests of Thyia Trees, where the Oracles were to be established. The ‘Thyiades’ were the female priesthood whose responsibility it was to conduct the Replenishment Rituals of the Thyia Tree each year to ensure re vegetation. The fleets of Taharka carried tens of thousands of Thyia branches heavy with un-opened nuts/seed-pods which can grow upon one another to a depth of several layers as seen on the Thyrsus on the Greek Vase displayed.. After cutting and transportation to Delphi and Dodonna, Taharka/Dionysus and Thyia/Athena initiated the first European Thyia replenishment rituals, where the priestesses carried the branches, heavy with ripe seed around the landscape marked for re-reforestation. Over the couple of weeks it took for the rituals, the seed pods would gradually open and the seed, which have little wings, would fly through the air like fairy dust, as the Thyiades danced around in an ecstasy each with a Thyrsus. The Sexual energy of the virgin priestess was directed into her ‘Thyrsus’ to add the powerful human life force to the seed and awaken it from its dormancy. The Satyrs etc. were the elemental creative forces of being invoked to cue the seeds to awaken. We give credit to Taharka for having the foresight to preserve the sacred knowledge by moving the oracle sites, and to his sister for propagating the sacred groves of Thyia. These centers were vital in the development of mathematics, geometry, philosophy and democracy, as well as cosmology and religious awareness. They were, in fact, the seedlings of all that make our present civilization what it is. The fact that the Thyia tree played such a vital and central focus of these important sites will forever make this tree, of all the trees in the garden, special. Thyia trees contain a marvelous medicine. Ancient peoples of Australia, Africa, and India have been using this tree from the dawn of human activity The 3,000,000 year old ‘Lucy’ comes from Ethiopia and would have sucked a Thyion ‘cough-drop’ (small ball of resin) now and again. Even three millions years ago a hominid could have benefitted from the effects of Thyion gum’s anti-viral, anti-bacterial and anti-parasite properties. Indeed, all of these properties have been well established by modern scientific research and could account for the unique significance of this tree. « Keepers of the Lost Ark?